Opening night of the San Pedro International Costa Maya Festival started out perfectly on Thursday when attendance was excellent and excitement was high. 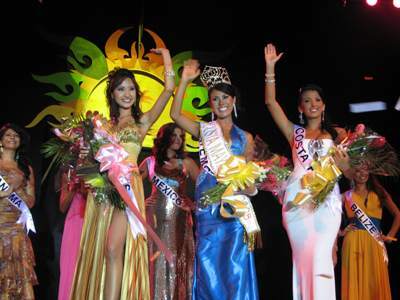 Everyone awaited the grand beginning of the Reina de la Costa Maya International 2008 Pageant. The mechanical games were up, the music was playing and San Pedro was ready for the festival to begin! The lights shone, the smoke emerged and from there the eight beautiful delegates materialized. All gorgeous and dancing to the beat of the music, the ladies all dressed in swimsuits and colorful sarongs made their presence felt on stage. It was the opening number and since then, the mood was set for a fantastic show. Miss Belize Jessie Medina, Miss Costa Rica Maria Elena Cordoba, El Salvador Daniella Augspurg, Miss Guatemala Jennifer Chiong, Miss Honduras Alejandra Mendoza, Miss Mexico Natalia Alvarez, Miss Nicaragua Karina Gordon, and Miss Panama Anais Solis delivered. Masters of Ceremonies for the night were Gloria Alejandra López Morales from Cancun TV Azteca and San Pedro’s Eiden Salazar Jr. The couple introduced Melita Castillo as the first performer of the night. With her melodic sounds of yesteryear, like Besame Mucho and other lovely selections touched the hearts of those present. The audience begged for more of the eight delegates and the costume segment satiated their hunger. The costumes brought out a kaleidoscope of colors and sparkles on stage. From feathers and fish, to elaborate head dresses, the ladies, through their costumes expressed part of their culture to the Belizean public and made everyone aware of the fact that even though we are separated by boundaries, our traditions unite us. Blues and oranges, reds and greens, pinks and purples, the stage shone with all the beautiful and vibrant colors. The second performance of the night came courtesy of two dance companies from Belize – the Belize National Dance Company and New Generation Band. 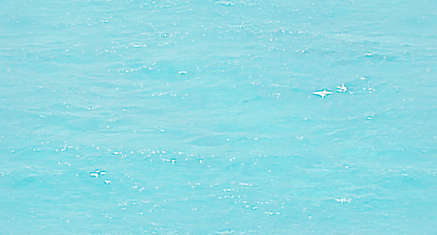 Following their performance was the swimsuit competition. Donning leopard print bikinis donated by Moon Dancer, the girls pranced on stage and showcased their athletic bodies. All eight contestants managed to enthrall the crowd as they strutted back and forth. Prior to the evening gown segment, the San Pedro Dance Company hit the stage in full force. Their energetic beats rocked the stage as they showcased, once more, the great selection and dance moves that they possess. Their hard work and dedication certainly paid off as they received great applause for a nice performance. The evening gown segment was full of glamour, poise, and elegance. As the representative glided gracefully down the catwalk, the music of flutes in a Mayan intonation rang throughout. Slowly, one by one, the girls flowed down, beautiful and elegant. The last performance of the night came courtesy of Belizean Melonie Gillett who brought out her best hit and the music from her new CD, Finding Me. As the hips swayed, audience members enjoyed the beat and the tempo that Gillett brought through her songs. Following the songs, the girls faced their toughest competition yet, the question and answer section; each girl walked up to the glass bowl, anxious to find out what their question would be. From the earth, to the Mayan civilization and the power of women, the ladies individually answered to the best of their ability. The moment of truth arrived shortly after, when the announcements were made; Best costume was worn by Miss Honduras, Alejandra Mendoza, who took the prize of a trophy to commemorate her win. The drums beat and as the Masters of Ceremonies revealed the name of the second runner up, and the honor went to Miss Honduras, who also won a black Coral necklace. First runner up was tightly contested and Miss Costa Rica, Maria Elena Cordoba walked away with the title, as well as a black Coral necklace. 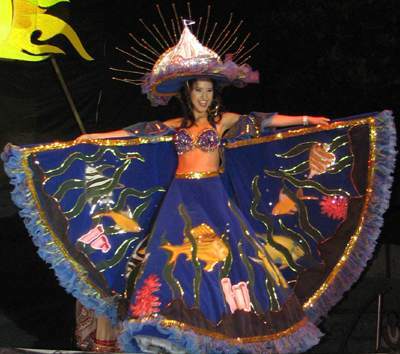 The drums beat louder and the audience held their breath, and the winner of the 2008 Reina de la Costa Maya Pageant was Miss Guatemala Jennifer Chiong! Along with a $500 cash prize courtesy of Liquor Box, she took home a black Coral necklace, and a dive course, courtesy of Eddie Ancona. Judges for the night’s festivities were Santino Castillo, Evan Tillett, Carole Gudreau, Miss Costa Maya 2004 Marisol Rojas, and Narda Garcia. The committee would like to thank all the sponsors who made the night a success, as well as express their gratitude to Mr. Rene Castañeda for his generous contribution of office space for the committee.